I love buying fresh peas when they're available. While I shell the peas out of their pods, I like to eat them raw. They're so sweet and crunchy, great just added to a salad! 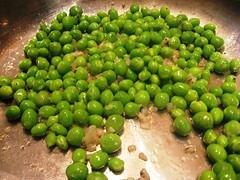 Peas are often added as an afterthought, like in chicken soup. It's not often the star of the dish. 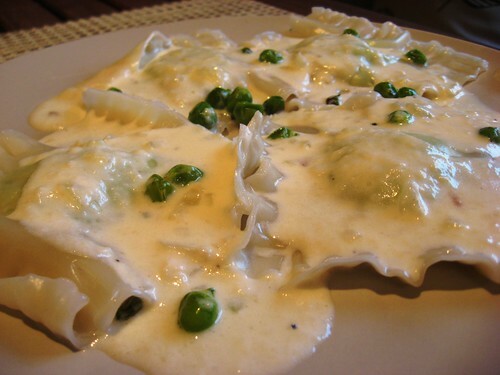 So I thought pea ravioli's would make a great dish to embrace fresh peas! I have still not attempted to make fresh pasta so I'm sticking to wonton shells for ravioli's. 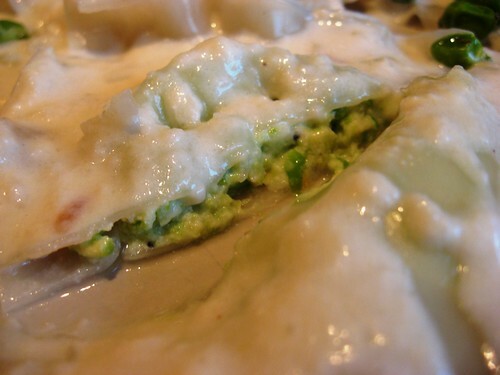 I don't feel bad about it either; it makes homemade ravioli's much easier and even Giada De Laurentiis uses them! I really like this filling and could have eaten it on its own, in big spoonfuls! Heat up oil on medium-high. Add the peas and cook until they're cooked through; it just take a couple of minutes. Set some peas aside for garnish. In a food processor, add the peas, ricotta, Parmesan and lemon zest. Taste and adjust seasoning according to taste. 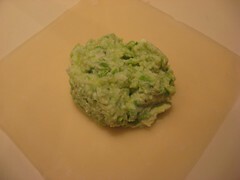 Lay one wonton wrapper and top it with a tablespoon or so of pea mixture. Wet the border of the wrapper and place another wrapper on top. Press on the border to ensure it doesn't open up and crimp the edges with a fork. To freeze the raviolis, place them on a parchment lined baking sheet and place in the freezer; when they are solidly frozen, place them in a plastic bag (this is so they don't stick together). In a pot of boiling salted water, add raviolis (fresh or frozen) - you don't need to thaw the frozen ones. When the raviolis float, remove them with a slotted spoon and let them drain. Stir in flour and cook stirring constantly 1-2 minutes or until bubbling. Whisk in milk or cream and bring to a boil, whisking constantly until thickened. Lower heat and stir in cheese, cook for 3-5 minutes stirring occasionally. Ladle sauce on cooked raviolis. I still have some left in the freezer and am thinking it might make a good meal this weekend. Yums! You are a girl after my own heart! I LOVE peas! Looks yummy!